from Johor Bahru, Johor, Malaysia. Still not finding a driver for traveling? Or are you still unable to find a driver to the airport? Do you want to enjoy the trip without worrying about parking? MBD Limousine picks you up at your doorstep and delivers you safely to your destination. 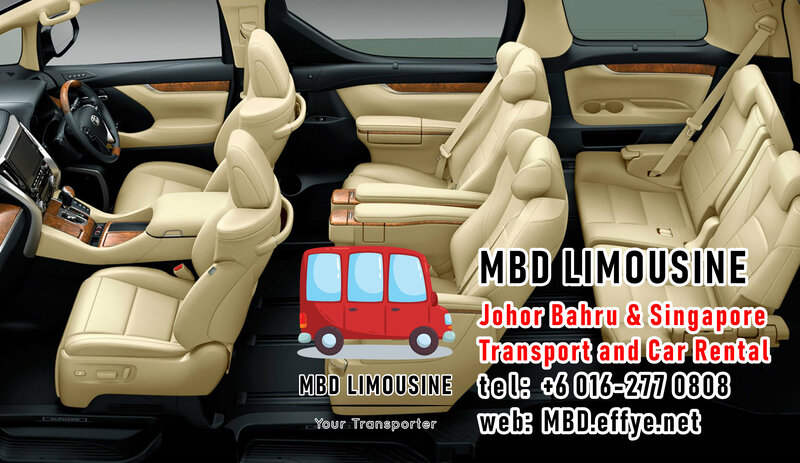 Whether traveling to and from Malaysia or Singapore, or a day to a few days, MBD Limousine is your loyal carrier to give you a safe and enjoyable journey. MBD Limousine meets the different delivery needs of its customers in their busy life. Whether it is a banquet, a festive, a wedding, we have a VIP luxury car service, so you can reach your destinations without worrying. In addition, we also provide private car transfers, student car transfers, managers, staff shuttles and other shuttle services. If you want to go out by driving, we can prepare a VIP luxury SUV for you! You can choose from a variety of models. Safe, comfortable and clean, giving you a smooth driving experience. MBD Limousine car rental service to meet your transport needs at any time. – VIP luxury MPV transport service. – Airport transfer and transport service. – Elderly person transport service. – Workers transfer and transport service. – Special event transport service. – Dinner party transport service. – Luxury car rental service. – Wedding car rental service. 🕵️‍♀️ We are looking for you! We are a transport service company located in Johor Bahru! 🏤 Office: Johor Bahru, Johor, Malaysia. * Requires several part-time and full-time drivers. * Retired military personnel are also welcome to ask. * Priority is given to retired military applicants. 🤩 Free working hours, excellent pay, interested, please contact and interview. 😍 We are offering an affordable Round-trip transport service between Malaysia and Singapore. 😇 Tour, meeting, good delivery, travel, transport, emergency…. 📱 Call us, we will serve you with best arrangement.